Assad’s chemical weapons risk turning Syria’s tragedy into something even more dreadful. This statement was notable for a number of reasons. Firstly, because it was the first time a Syrian official acknowledged what the world has long known-that Syria has stockpiled chemical weapons (CW). Secondly, because everyone’s worst fear- the possibility of their use- was not only mentioned but also confirmed, at least in reaction to a foreign intervention. Furthermore, besides the statement itself, Syria’s state of civil war inevitable leads to fears that the regime will loss control of its chemical weapon stockpiles. This scenario is all the more troubling given the alleged presence of al-Qaeda linked fighters in the country. 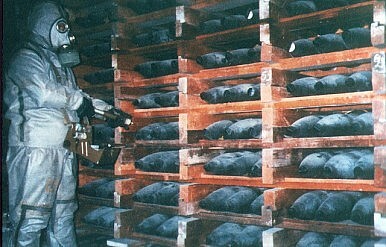 Syria’s chemical weapons program is shrouded in secrecy. Very little is known about the size of its stockpiles or their exact locations. What is known is that it has developed Sarin and Mustard gas and possibly VX and Cyanide. It is estimated that Syria has four production facilities located near Aleppo, Hama, Homs and Latakia, along the coast, as well as scores of storage facilities, spread around the country. The problem is no one knows their exact location, making it difficult for the international community to initiate a limited military excursion aimed at securing these materials. It is also difficult to say with certainty whether the regime has full control over their stockpiles or not, especially since some sites are close to areas of unrest. It seems likely, however, that it still does retain control over these weapons. To begin with, CW facilities will almost certainly be heavily guarded by security forces deemed especially loyal to the regime. And while reports that Assad has been moving his CW stockpiles have usually framed this move as a prelude to possibly unleashing them on the opposition, it seems equally likely that they were being moved to safer locations as the unrest has spread. After all, the regime has invested enormous resources into developing these weapons over the course of decades, and has a strong interest of keeping them out of the hands of the rebel forces. Nonetheless, given Syria’s porous borders, the nature of its regional alliances, and the reported Sunni extremists among the opposition make the issue too important to simply assume the Assad regime will continue to maintain its arsenal and exercise full restraint in terms of using it. The international community must, at the very least, have a backup plan should this assumption not hold. What this plan should be, however, is less easy to figure out. The lack of intelligence and resources limits the options available to secure Syria’s chemical weapons. Perhaps the most “popular” option is airstrikes. Israel has not made it a secret that it would act decisively if it felt that Assad’s regime was losing control of its stockpiles, particularly if that risked Hezbollah acquiring them. Israeli Defense Minister Ehud Barak stated: "I've ordered the Israeli military to prepare for a situation where we would have to weigh the possibility of carrying out an attack…" But a military strike is risky, especially when the location and size of the facilities are unconfirmed and Syria has a robust air defence system in place. Further contributing to these difficulties is the possibility that air strikes will have the perverse effect of releasing agents into the atmosphere or that some munitions will survive even while the security forces guarding them perish. Seen from this angle, then, airstrikes might be worse than doing nothing at all. The alternative would be to send ground special operation forces to physically secure the stockpiles. But this too is a difficult task. Once again, the intelligence would have to be watertight before any leader would send in troops and expose these soldiers and the country to the unrest. The number of troops needed would be considerable given the size and spread of Syria’s program, and they would have to be properly trained and equipped to handle such sensitive materials in such hostile circumstances. In addition, a more long-term commitment to safeguard the spread of ‘knowledge’; the experts, scientists, and procurement staff involved in Syria’s chemical weapons program, would have to be initiated in the event of Assad’s ouster. This would be a costly venture and the majority of the costs would likely fall upon the United States. Neither option is attractive, which is why smaller measures must be (and are being) taken to ensure that none of these worst-case scenarios can be avoided. The first is to deter both Assad from using them and the opposition from acquiring them. The U.S. and Israel have gone to considerable lengths to signal that the use of chemical weapons would be their 'redlines'. In doing so, they’ve sought to make the regime’s use of CW the equivalent to signing its own death warrant. More importantly, some of Assad’s allies have apparently been doing the same. Russia’s Foreign Ministry, for example, recently claimed to have “laid out in an extremely clear form Russia's position on the inadmissibility of any threats of the use of chemical weapons” in a meeting with the Syrian Ambassador. If Assad isn’t deterred by the prospect of Western military intervention, losing the support of his few remaining allies might be enough to restrain him from using his CW stockpiles. The U.S. is also reportedly working with Syria’s neighbors, such as Jordan and Turkey, to draw up contingency plans in case the unrest spills over Syria’s borders. Such planning should be extended to safeguarding Syria’s chemical weapons, including securing its borders to prevent weapons from leaking across. In the longer term, however, the most effective way of handling Syria’s aging CW arsenal is by strengthening international export controls. Not only are chemical weapons susceptible to degradation, but Syria also remains highly dependent on foreign supplies for producing these weapons. Denying it these supplies will therefore help curb Syria’s inevitable future procurement efforts. Despite the horrid violence raging in Syria, ultimately Syria’s CW supplies may prove to be the biggest menace. Increasing surveillance and international cooperation, serious contingency planning and reiterating redlines, are the only immediate options available while we wait to see how the Syria crisis unfolds. Dina Esfandiary is a research analyst and project coordinator at the International Institute for Strategic Studies. Will Russia Regret “Owning” Syria? Putin has established Russia as Assad’s patron. As the US can attest, that’s not all it’s cracked up to be.